Soft skills are people skills. The skills necessary to have a meaningful conversation, to talk about a conflict situation, to deal with interpersonal differences, to express how you feel about something or someone, etc. Most of us have had little education in the development of these very vital interpersonal skills. It’s not until we wind up as adults that we realize we might not be the best communicators. And, we’ve learned how we say things matters. Sometimes because we don’t know the best way to say something, we just don’t say anything. Or, we choose an inappropriate channel and likely cause a misunderstanding. The channel is the way you choose to send the message. It could be face-to-face, text, email, phone, video conference, presentation to a group, fax (yes, people still occasionally use the fax machine) FedEx or snail mail. Anytime we have something to say we need to consider the audience, the content and the channel. Given communication breakdown is possible every time we communicate, it is critical we choose the channel that is best suited for the receiver and the content of the message. Because the “soft skills” are the hardest to master, people have begun to use the text and email channels as a way to avoid uncomfortable subjects, conflict, confrontation and other types of important face-to-face interpersonal communication. Don’t get me wrong, text and email have many wonderful uses, just not for anything that is very personal and complex. Since a very large portion of an interpersonal message is comprised of non-verbal language (vocal cues, body language, eye-contact, etc.) using email and text reduce the probability that the message you send will be the message that is received because you won’t be able to read body language and ask direct questions. People don’t always make the right channel choices. Stop and think before you start speaking or writing. Be mindful and make conscious choices. Ask yourself if text or email is the BEST channel to choose for the message you want to send. Or, would face-to-face, the phone or a video chat be better? If you do decide to use text for a quick note, be sure the number you’re texting isn’t a landline. I got an email from a client recently that said, “ Hope all is well with you. I sent you a text the other day and wanted to know if you would have a few moments to catch up.” Turns out he was texting my business landline and not my cell phone. If he didn’t follow-up with this email he could have thought I wasn’t interested in him as a client and I could have lost work since I didn’t reply to his text. Avoid choosing channels which can increase the likelihood the consequences of your choice will be hurt feelings, guilt trips, rumors running rampant, misunderstandings, wasted time, lost productivity, anger, frustration, or loss of human connection. Make careful channel choices and you’ll be on your way to increasing productivity and decreasing communication breakdown while preserving important interpersonal relationships. Engage Your Audience. Forget the Bullets. Tell the Story! 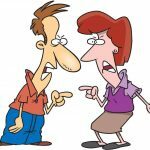 Interpersonal Communication is at Risk!